Let me share my perspective: “Boardrooms today have windows and the public is looking in.” The world is watching and listening. We now expect leaders to keep us informed on their activities related to our shareowner’s interests. The days of hiding are over, as one billion people are talking among themselves about you. So I urge you to speak with your CEO and board about building trust by facing the public. It starts by broadening your vision of who matters to your business success. It is critical that you start listening to the conversation happening outside the boardroom. 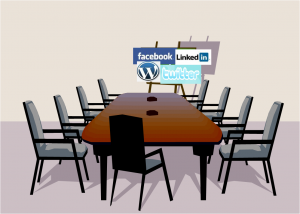 But what does a CEO or informed director need to do to oversee the social media conversation? First, they need to decide that the time is now to learn about social media and how the pieces fit together. If you’ve been too busy, the time to learn is now. This is a customer, an investor, an employee issue and more. It begins with monitoring and listening to what is being said about your company. There is data that is waiting to be analyzed, but you need to be ready to bring digital intelligence to your business thinking. Let’s keep this in perspective–I’m not suggesting a CEO or director should communicate using social media (Facebook, Twitter, LinkedIn, to name a few), however, they should ensure that they get briefed on the conversation happening around their business. How else can you ask good questions about what is being said that could impact your revenue, reputation and more? Here is a recent Stanford Graduate School of Business article that does a great job of looking at the risks associated with social media and the boardroom.